Cleveland Browns receiver Andrew Hawkins talked to one person about his decision to come out of the players’ tunnel wearing a black shirt with white font spelling out the names Tamir Rice and John Crawford on the front. His mother was scared for him. He was scared for himself, and cried as he thought through the choice. In the end, Hawkins explained there wasn’t more than one choice involved in his decision, he knew what the right thing to do was. So he walked out of that tunnel on Dec. 14, 2014, knowing that he had the platform to bring attention to two local tragedies. Twelve-year-old Rice was killed by a police officer while playing with a BB gun in a Cleveland park, and Crawford was killed in Cincinnati while checking out a toy gun in Walmart. Hawkins was leading the team in receptions, receiving yards and tied for second in receiving touchdowns that season. He was in the first year of a four-year contract with the Browns. At the time, the four-year NFL veteran had spent his first three seasons with the Cincinnati Bengals. The six-year pro is back at training camp with Cleveland after being placed on injured reserve by the team following two concussions early in the 2015 season. Going into 2016, he has 176 catches for 2,095 yards and six scores. He is also one semester away from graduating from Columbia University with a master’s degree in sports management. 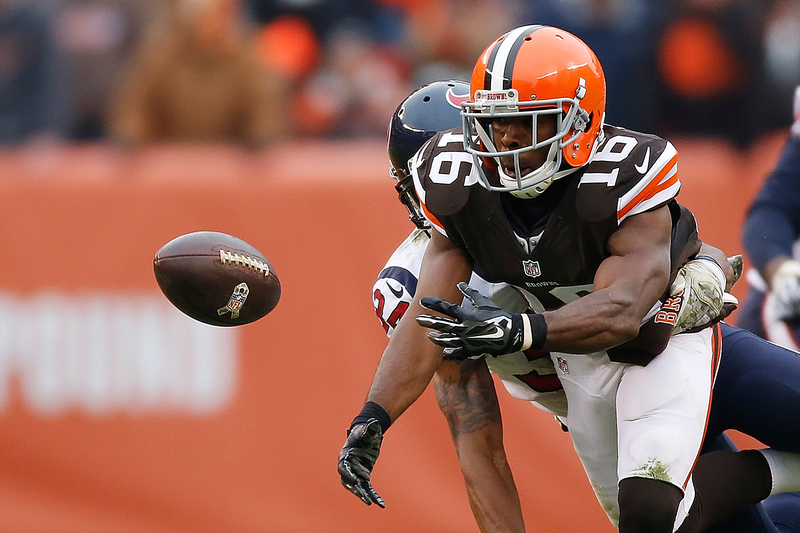 Andrew Hawkins #16 of the Cleveland Browns can’t make a catch in front of A.J. Bouye #34 of the Houston Texans during the third quarter at FirstEnergy Stadium on November 16, 2014 in Cleveland, Ohio. In 2014, Hawkins was one of a handful of athletes who openly spoke out against police brutality against African-Americans. Now he’s watched as athletes such as Carmelo Anthony, LeBron James, Glen “Big Baby” Davis, the Minnesota Lynx, New York Liberty and more are speaking out against the injustice that persists in the United States. He reflected on what led him to wear the shirt with Crawford and Rice’s names on it, the need to support black women who are being brutalized, the life lesson he learned at 11 about being a black boy with a toy gun and why his protest is the important thing he’s done in his career. I think it’s sad, and from a lot of standpoints. I don’t believe it’s anything new that’s going on from any side, of any matter. I believe this is kind of the way this country has always been, but in the technology age or in an era of access, we’re just seeing everything kinda come to the forefront. Like every other industry, and every other sector of America or any part of it, there’s more access. There’s more information available, and I think that’s what is kinda adding fuel to the fire. I think that’s why you’re seeing such a conversation about it, and it being such an issue in America today is because you’re seeing video, you’re hearing audio and you can’t refute that. When you’re watching something, it’s hard to make a case either way, except by what you see or what you hear. I think that’s what’s been the biggest difference. I don’t really think it’s anything new. You know honestly, I don’t think that any of the conversation is for a person like that, that like you said finds any way to justify someone being killed or justify any wrong thing on either side of it. That’s not the person that you want this conversation to be geared to. It takes an intelligent person to be able to look at the situation of somebody else and put themselves in their shoes and see it full picture. Now, there’s, to be quite honest, not a lot of people that have that level of intelligence, that level of empathy to be able to take yourself out of the situation, out of the way you were raised, out of what you believe the world is and see it from somebody else’s perspective, because honestly, we all live in a different world. We all were born different, we were on different levels of the playing field, we were from different backgrounds, so we all view the world different. Our experiences are all different, and for someone to see that, and when they do that, like I said, it just automatically to me, says, ‘OK, that’s a person who thinks that the world is exactly how they’ve viewed it since they were a kid.’ That’s a tough thing to do. When you think your perception of the world is correct, and everything you’re taught is fact, you don’t want to back away from that, because then it kind of uproots everything for you. So you will die trying to defend what you’ve believed your entire life. So like I said, you would expect that. You’re going to have that on both sides. You’re going to have that in any situation. But it’s not about people to me. People are liars, people are evil. There’s good people, and there’s bad people. That has been since the beginning of time. The real issue becomes the systems. The systems shouldn’t be flawed. People are flawed, in every walk of life. … When there’s a human element involved, there’s going to be flaws. The system is the real issue, so when you kind of make it about people from anybody’s perspective, or whatever, that’s not the issue with me. I try not to put too much credence on it cause, like I said, because that’s not going to help us get anywhere either way, except for if we can fix the system in itself. Hopefully you get people in place that are the intelligent ones. That understand it from every side of the equation, that understand that no matter what I believe personally, or what I grew up believing, that the system should not be flawed. That’s the whole point of a system in the first place, otherwise you don’t need it, because you can just go off of your opinion and just pick whatever you want to pick as the right thing and that will be it. Like I said, that’s not what America is about. That’s not what the Constitution is about. It was set up so it shouldn’t have flaws, for the legal system should police itself. It’s set up to not what if, but even if, people are flawed, even if the people in power are flawed, the system makes it right. If we took the laws, as is and we actually stuck to it, then it would work. But then again, flawed people involved is what makes it not work. So I think that’s where the uproar is. That’s where the people are fed up from a lot of standpoints. 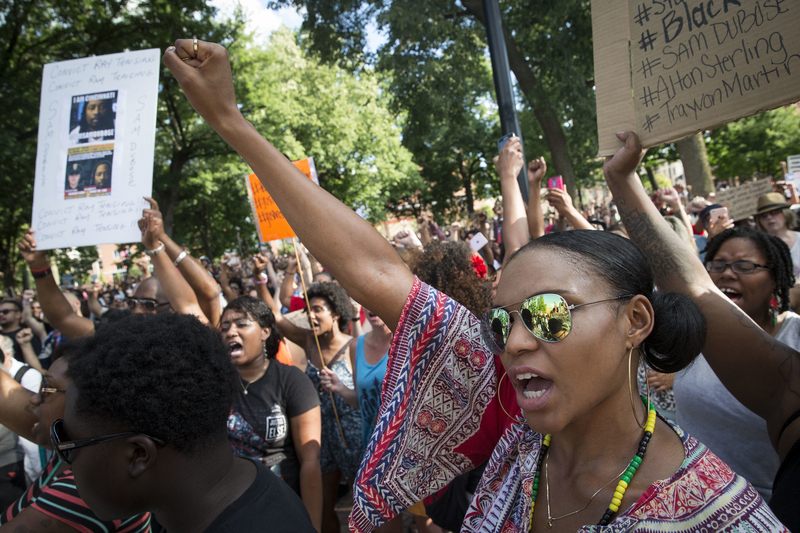 Protesters rally at Washington Park, Sunday, July 10, 2016, in Cincinnati. Hundreds of people have gathered for a Black Lives Matter rally in Cincinnati following the fatal shootings of black men by police in Louisiana and Minnesota in the past week. Why not? I can think of a million people that would love to have this conversation with you, but The Undefeated doesn’t want to talk to them, because they don’t play professional football. I have sisters that would love, they would keep you on this phone for three hours, and tell you everything that you wanted to hear. They are so passionate about this topic, and they encourage me. They would scream from the mountaintops if you gave them the platform. But the way it’s designed that’s not how it is. So shout-out to [my sisters]. [Actress] Gabrielle Union, she’s incredible. She speaks about [black women’s lives mattering] every chance she gets. She tweets about it. It’s not covered, but it should be, because it matters. But I don’t know how many clicks that would get. I don’t know how interested they would be in hearing Joe Schmoe from wherever. So for me personally, I have this platform to talk about it and my opinions, and this is what I believe. So I don’t know how long I’m going to have this platform. If I’m not in the NFL in two years, I don’t know if you circle back to me and say, ‘Hey, do you want to talk about this?’ Cause I’m not as relevant then, so it’s kind of a responsibility thing in my case. I’m not a household name by any stretch of the imagination. Yeah, I led the Cleveland Browns in receiving [in 2014]. Yes, I’ve had a long NFL career. Professional football career and all that, but at the same time, I didn’t do that for any other reason but to draw attention to something that I felt passionate about. There wasn’t a lot of people doing it at the time, and that was like the furthest thing from my mind. And even afterwards, literally CNN, MSNBC, Time magazine, every station, every publication, they reached out to me to come speak on the subject. But it was important to me in that situation to not make it about me. So that was kind of by design that I said what I said, stood up for what I believed in and played it back, because I wasn’t the person that they needed to be talking to. And every time, I would say you need to talk to Tamir’s mother, because she’s going to talk on this situation better than I am. I didn’t want to make it about me in any way. I didn’t want it to come off like I was doing it for the wrong reason, like I was just trying to do it for attention or I was trying to thrust myself or do the media circuit. That wasn’t it for me. This was something that tormented my soul seeing that video. So it was like, ‘Man, I want to draw attention to this,’ because at the time people weren’t talking about the Tamir Rice situation on the national scale, the way they do now. I just wanted to do my part to make it a big deal, because it needs to be a big deal. These are the steps that need to be taken for change, whether it’s in two years, five years, 10 years or whatever. I just wanted to try and play my part in the equation. I have not spoken to Tamir Rice’s mother. Hopefully that changes soon, but no, I have not. I don’t know [what I would say to her]. Nothing I would probably put in an interview. We’ll have that conversation eventually, hopefully. Like I said, I just feel for her. I remember when I was 11 years old, and I would go to church with my mom. On Easter, we would have our program, and then they would give all the kids toys. Little cheap toys from Dollar General or something like that. One year, I got this … gun that shoots the little things that sticks to windows; the dart gun. The gun itself looked like a real gun. This is back in the day, where it wasn’t a law that they had to have orange tips to sell. So I got this gun, and I’m a little kid, and I got brothers, and we’re out shooting around. So I’m at home, and I have the gun, and my mom was like, ‘Give me that. Don’t touch it. I’m getting rid of it.’ So like the next day, I went and found it, picked it up, took it outside, and she comes home that day, and I’m outside with the gun with my brothers and she comes in and she goes off on me. Whoops me and everything, and basically had the talk with me that, ‘You can’t play with toy guns, because someone’s going to think it’s real and you’re going to get shot.’ And as a little kid, I’m like mad, because all my friends at school have BB guns, and I’m like, ‘This isn’t even a BB gun, you can’t even hurt anybody with this thing.’ I didn’t understand it back then, right? So I had a brother that’s two years older than me, and he kind of reaffirmed the conversation to me, and so I remember going out after I got my whooping, and I can vividly remember putting it in the top of the trash can outside, closing the lid, and being like, ‘Man, that was an awesome toy.’ Well, fast-forwarding to now, I’m seeing this video. And when I watched the video, that whole situation played back to my mind now. It wasn’t the first time I had thought about that situation. Obviously, you get older, you get wiser and you realize mom was trying to protect you, but it’s like, dang. Here were are 20 years later, and that conversation still has to be had. That’s what tormented me. And I have a little boy, and that’s crazy that I still have to have that conversation with my son 30 years later. That was the biggest thing to me. That’s not a conversation you want to have with your kids. You have to have a lot of those uncomfortable conversations, but that’s not one I feel like I should have to have. My heart was broken for the mom, me being a dad. My son is my best friend, and I have two twin daughters and they’re my best friends. That’s important to me. I get emotional about it, because it tugged at my soul. That emotion is kind of what sparked everything. … What can I do to help? And it was uncomfortable, and it was a situation that I knew had all the makings to vilify me, but it was what’s right and what I believe. What parent doesn’t want their child to stand up for what to they believe in? 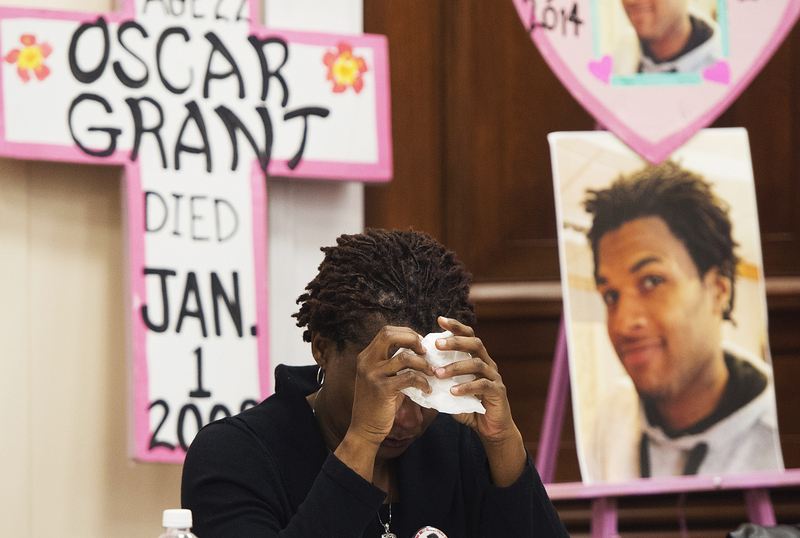 Tressa Sherrod cries after telling the story of her son, 22-year-old John Crawford III who was shot and killed by police in an Ohio Walmart, during a press conference with other mothers who have lost children due to police action as they call for police accountability and reform on Capitol Hill in Washington, DC, December 10, 2014. Crawford was fatally shot and killed by a white officer in a Wal-Mart store in the Dayton suburb of Beavercreek, Ohio, as Crawford carried an air rifle picked up from a store shelf. It was at the same time that the John Crawford situation was happening in Cincinnati, and I played in Cincinnati for four years … that’s like a second home to me. Here I am in Cleveland, and we’re in Ohio, and it just so happens that the Cleveland Browns and Cincinnati Bengals were playing each other. I had somebody, a T-shirt company nearby, make it. I wrestled with it a lot. The only person I really consulted was my mom the day before. She was like, ‘Well, figure out a different way,’ because she understood what was going to happen. She understood the firestorm it was going to create, and I did too. I cried about it the day before, because you’re scared. My granddad would always tell me when you’re scared, if it makes you stop what you know you’re supposed to do, then that’s what makes you a coward. It didn’t feel any different. Here I was and I’d walked through the tunnel a million times. It didn’t hit me until later that night. I don’t know. That’s just the way it’s designed, I guess. That’s a tough question, it’s people. It’s always going to come back to flawed people not understanding that before you are were you, you had a life before then. You were taught values, you’ve had certain experiences in life. I guess people just don’t understand that and, or they feel like you should just be happy where you are. We didn’t put you in this place for you to speak your opinion. I honestly don’t think that everyone should speak their opinion on everything. Because if you’re not passionate about something, if you don’t know, if you don’t understand what you’re speaking about, then you shouldn’t. If you don’t really care about it, then let it go. Don’t just jump in the conversation just to jump in the conversation. I’m against that. But people who are standing up for other people, come on, this is America. This is what it’s supposed to be about, so who are you to tell someone not to stand up for what they believe in America? How backwards does that sound? You have to live with you, and I can do that. That was the biggest thing for me. When it was all said and done, I was proud of myself. That was the proudest moment of my professional football career and it had nothing to do with football.